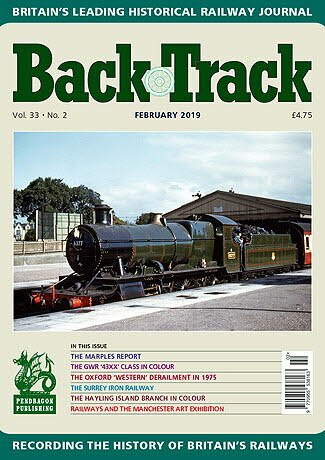 Railway Magazine | BackTrack February 2019 journal from Pendragon Publishing. Piccadilly - with diesel power: colour spread by Tom Heavyside of diesel traction at Manchester Piccadilly station in the 1980s. Crane Laying of Prefabricated Track: Part One - In the first of three instalments Peter Tatlow looks at the mechanisation of relaying pre-assembled track. The Marples Report: Ernest Marples - the saviour of Britain's Railways or their saviour? : Part One - Mark Tittley considers the role of a controversial Transport Minister. Beamish before the Museum - David Milburn recalls an industrial line in Co. Durham. A look at Lincolnshire - coulour spread of A. J. Clark's colour photographs. Kirkcaldy Harbour : Town versus railway - Alistair F. Nisbet finds an uneasy relationship. Let's go to Blackpool - four pages of archive photographs. One Thousand Miles in 24 Hours - Alistair F. Nisbet describes the adventure of a 1910 railway explorer. The '43XX' Class: Useful Great Western Locomotives - four colour pages of these widely used 2-6-0s. Taking the Cure - the second part of Dr. Malcolm Timperley's account of the railway to Strathpeffer. All in the County of Surrey - James Graham presents the story of the Surrey Iron Railway. A Premier Line Pair - two coloured pictures of LNWR locomotives by David P. Williams. A Close Escape - Personal recollections of the 1975 Oxford derailment as told to Paul Joyce by former loco inspector Bob Judge. Last Call for Hayling Island - colour photos of the last rites on the branch from Havant and the Langstone Harbour Bridge. Railway Involvement in the Manchester Art Treasures Exhibition 1857/8 - by Jeffrey Wells. Not the Big Four - Geoffrey Skelsey presents examples of tickets from some independent railways. Great Eastern Signal Boxes - colour photos by Richard Foster. Derby Staff Training College - Tony Robinson describes a railway facility introduced by the LMS.